Drop by the lively floating markets of Cai Be, learn about Vietnam’s French-infused past or soak up the melting pot of culture that is Phnom Penh. Explore the ancient hilltop monastery of Wat Hanchey and immerse yourself in the beauty of Khmer handicrafts in Cheung Kok, as you gain a deeper understanding of the complex histories and bright communities embracing rural life along the river. Fly overnight from a choice of UK airports with selected airlines, including Emirates via Dubai, from London Heathrow, Birmingham, Glasgow, Manchester or Newcastle. Alternatively, fly with Singapore Airlines via Singapore from London Heathrow or Manchester. Welcome to vibrant Vietnam. Upon your Arrival in Ho Chi Minh City, you’ll be transferred to the Park Hyatt Saigon for your overnight Special Stay. Formerly known as Saigon, Ho Chi Minh City is Vietnam’s largest city, and the former capital of the Republic of Vietnam. Once recognised as the Diamond of the Far East, it now has the country’s highest population, offering modern skyscrapers that exist harmoniously with oriental-style pagodas and streets lined with food stalls. After lunch, travel by coach to My Tho to board the luxurious Scenic Spirit. 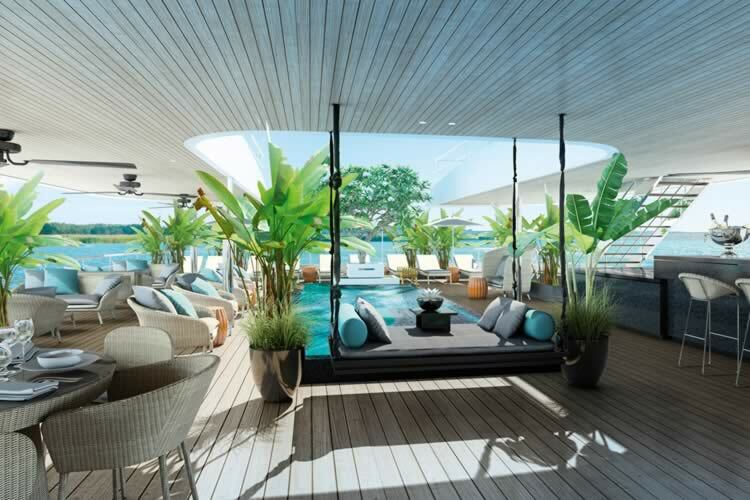 Perfectly proportioned for negotiating the meandering course of the Mekong and yet, despite its seemingly petite size, 34 generous guest suites, each larger and better appointed than any other river cruise suite on this mighty Asian waterway. Given its modest passenger carrying capabilities, you’ll enjoy an appreciation of space when journeying aboard, not to mention a sense of intimacy. Toast to the start of your cruise with a cocktail reception. Freechoice: Board a sampan to visit Cai Be before stopping at local cottage industries and a French Colonial or traditional Vietnamese house. Alternatively, savour morning tea at a French Colonial house or choose to stay on board for your special Freechoice activity. Later, immerse yourself in the historic town of Sa Dec and explore and interact with the sellers in the lively market. Also, visit the home of Mr Huynh Thuy Le who inspired Marguerite Duras’ novel L’Amant. Freechoice: Visit Evergreen Island and enjoy a ride in a Xe Loi to a silk factory. In Chau Doc, visit a fish farm before walking through the local market, or visit Tra Su Bird Sanctuary. On board, enjoy a themed farewell dinner. Enrich: Arrive in style by Tuk Tuk at the celebrated Raffles, Hotel Le Royal. Journey to the Killing Fields or take a guided tour of a local food market before attending a Khmer cooking demonstration. Alternatively, explore Phnom Penh by Tuk Tuk before lunch at a local NGO restaurant. This afternoon, marvel at the Royal Palace, with its famous Silver Pagoda. Experience an ox cart ride through a local village. Enrich: Receive a blessing from a monk and learn how to pray in a Buddhist pagoda before partaking in a ceremony. Later, sail down the Tonlé Sap to the village of Kho Chen before continuing your cruise to Kampong Cham. Meet the resident novice monks at Wat Hanchey, an ancient hilltop pagoda and monastery. Freechoice: Visit Phnom Pros and Wat Nokor, an 11thcentury temple that has a modern pagoda built within. Alternatively, explore the village of Cheung Kok or visit a rubber plantation factory and betel nut village. Discover rural Cambodia on your drive to the Park Hyatt Siem Reap, your stylish three-night Special Stay. Enrich: Take your seat at the colourful Cambodian Circus, Phare. 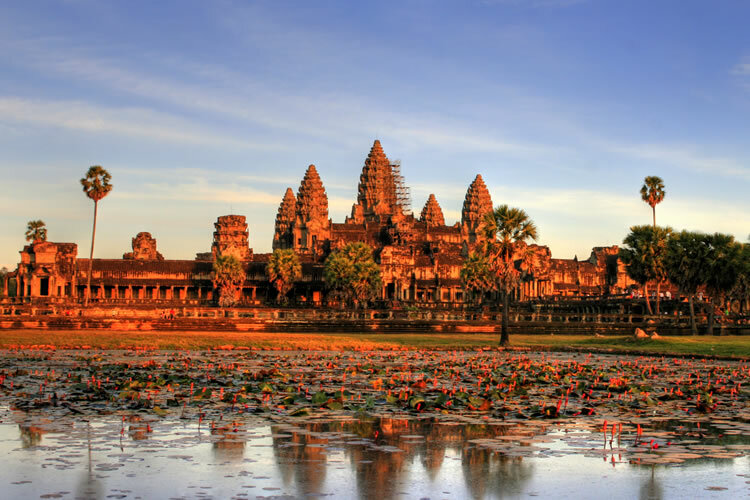 Visit the colossal Angkor Wat, before stopping at Angkor Thom and the multi-faced Bayon Temple. Located at the heart of Angkor Thom, the 12th-Century Bayon Temple was built by King Jayavarman VII, Cambodia’s most-celebrated king. Carvings on the outer wall depict scenes of everyday life in 12th-Century Cambodia. Exuding grandness, over 2,000 carved faces give this majestic temple its unique character and the absence of a roof makes it the perfect photo opportunity at any time of the day. Later, visit the atmospheric jungle covered Ta Prohm Temple. Take advantage of your free night to visit the Night Markets. Enrich: Marvel at the sunrise over Angkor Wat before moving to a special location for a champagne breakfast prepared by an NGO-supported local bakery school. Freechoice: Discover Banteay Srei and visit the Landmine Museum or explore the Beng Mealea temples and Artisans D’Angkor. Alternatively, cruise on Tonlé Sap or take a tethered balloon ride above Angkor Wat before visiting a Pouk Silk Farm and Preah Khan Temple. Enrich: Attend an exclusive gala dinner at an Angkor temple, with complimentary drinks and a traditional Apsara dance performance in front of the temple ruins.